First it was Cars. Now it is Planes. DisneyToon Studios is bringing another animated mode of transportation to the big screens with the new movie of the same name. 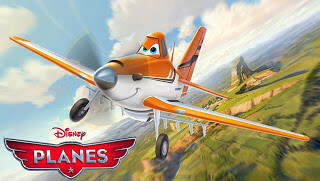 Planes is a 3-D computer animated film and is set to be released by Walt Disney Pictures in the USA on August 9 despite originally being intended to be a straight-to-DVD venture. It is a spin-off the Pixar Studios Cars franchise and is expected to be a franchise of its own as it is to be a trilogy. The cast of comics includes British actor John Cleese as British Bulldog, Brad Garrettof Everybody Loves Raymond as fuel truck Chug, Dane Cook who voices Dusty Crophopper, Cedric the Entertainer as the fertiliser-spraying tanker Leadbottom, and Julia Louis-Dreyfus as ex-Canadian mail plane Rochelle. Teri Hatcher and Stacy Keach are also among the cast. The team from DisneyToon helped create the characters by going out and taking pictures of various types of planes and then trying to match them with the voice actors. The film is geared both towards children and their parents so the adults can enjoy the sophisticated humour as well.